Worship with us every Sunday at 10 AM. By the word affirming, we signify our support and celebration of all human relationships based on commitment, loyalty, love & mutual respect. On July 1, 2015, the Rev. Claudia Schmitt became our pastor-in-charge. Here are some thoughts from Claudia. Welcome to the web site of the Wheat Ridge Congregational Church of the United Church of Christ! We are a loving fellowship committed to following the Word of God through the teachings of Jesus Christ. We are a progressive, compassionate, thoughtful, open-and-affirming congregation. We believe that the core of the Christian gospel is the message of God’s love. As Christians, we profess Jesus as the central revelation of God’s love and understand Jesus as a distinctive prophet and savior who came into the world, ushering in a novel, loving, creative, whole-making dynamic that is as relevant and transformative today as it was then. As a church we hope to provide a place where programs, people, and compassionate living bring relevance, clarity, and direction in the face of life’s most difficult challenges. As a faith community we offer opportunities for spiritual deepening and healing while also living out Christ’s call to respond to the needs of our world. At WRCC UCC we attempt to offer a worship experience with depth and quality while also being accessible and welcoming for those who have little or no personal experience with church traditions. Some of our members would say that at our church they are “recovering” from earlier experiences with churches that they found to be strict, moralistic, or implausible. At WRCC UCC we care about people, God’s creation, spiritual development, intellectual curiosity, meaningful living, social justice, fellowship, and simply being kind to one another. We don’t try to be perfect but we do seek to be authentic. We aren’t overly idealistic but we do believe that with God’s grace, God’s inspiration, and our loving action, we can and do make a difference in the world. If you decide to visit us we want you to know that no matter who you are or where you are on life’s journey, you are welcome here. • Claudia grew up in California and was ordained by the UCC in 2002. More information about Claudia is provided on the Pastor's Page of this site. Our previous minister, Rev. David Conner (Claudia Schmitt's husband! ), continues on our staff as co-pastor in a supportive role. You may email Claudia or David at wheatridgeucc@gmail.com. • On June 6, 2004, we voted to become an Open and Affirming Congregation of the United Church of Christ. Our own Open and Affirming Resolution appears on our Moderator's Page. • We are known for our excellent music program under the direction of Rosanna Rains. On January 1, 2015, we hired our organist, Nancy F. Conner. We think Nancy is a terrific organist. • Our spacious sanctuary, designed by an award-winning architect, provides a creative and inspiring setting for worship. Our building is wheelchair-accessible. • We are a friendly congregation, welcoming persons of a wide variety of backgrounds and orientations. • Most of our members identify themselves as "theologically moderate" to "theologically liberal." The Wheat Ridge Congregational Church, United Church of Christ, is one of the oldest continuously worshiping churches in metro Denver, having been organized on May 20, 1882, as the "Boulevard Congregational Church." The people first met in the Webber home at 2535 Federal Boulevard. Within six months congregation was conducting services in a debt-free brick building located on the northwest corner of West 26th and Federal. 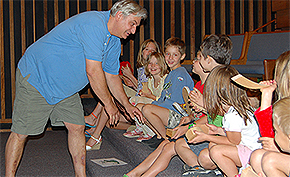 The Wheat Ridge Congregational Church, United Church of Christ, has a long and proud history of valuing the importance of Christian education for both youth and adults. Our Sunday school classes meet each Sunday (September through May) during the 10:00 AM church hour. 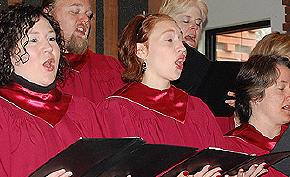 On February 1, 2008, the church hired Music Director Rosanna Rains. Rosanna came to us after an eleven-year stint as Choir Director at the Washington Park United Church of Christ. Rosanna holds a bachelor's degree in music and a graduate degree in psychology. Ro and her spouse, Deana, live in Lakewood. Earth Day. Special observance during our worship service. Mothers' Day. Moms honored during worship. The Wheat Ridge Congregational Church of the United Church of Christ is a loving fellowship committed to following the Word of God through the teachings of Jesus Christ. Here's a sample of a few of Claudia's sermons. We will be posting additional sermons as time goes by. For an index of sermons, click here. The United Church of Christ has a somewhat liberal or open-minded reputation. The United Church of Christ was formed in 1957 by a merger of the Congregational Christian and the Evangelical and Reformed ("E & R") denominations. Wheat Ridge Congregational Church is a relatively small congregation. However, what we may lack in membership size we more than make up for in enthusiasm, generosity, and Christian love. © 2019, Wheat Ridge UCC.